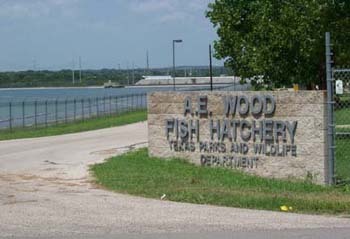 The A. E. Wood Fish Hatchery was originally built in 1949. It was named for A. E. Wood who served on the Texas Game & Oyster Commission, a forerunner of the Texas Parks & Wildlife Department. The hatchery was a mainstay of warm water fish production for Texas until 1984, when it was closed for renovation. After four years and $14 million, primarily from Federal Aid in Sportfish Restoration, Texas Parks & Wildlife Department reopened one of the most modern fish hatcheries in the United States. The main hatchery building is named in honor of Robert J. Kemp, who served as director of TPWD's Fisheries Division for over 20 years. The 33,000-square-foot building houses intensive culture operations. It includes a modern incubation room, shipping and holding troughs, and production raceways. The building also houses a complete laboratory capable of water quality testing, genetic identification, fish disease diagnosis and treatment, and law enforcement forensic techniques. The outside portion of the facility consists of 50 plastic lined ponds that provide nearly 47 surface acres of water. There is also a 9.5-acre storage reservoir, two wastewater retention ponds and a zooplankton production pond. Water for the facility is obtained from the spring-fed San Marcos River. 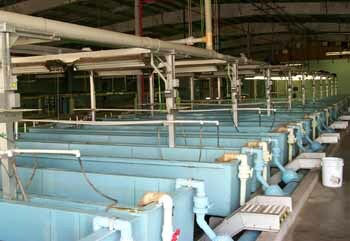 The hatchery is responsible for raising millions of fish each year for stocking into the public waters of Texas. The staff is also active in performing research in many areas of aquaculture.